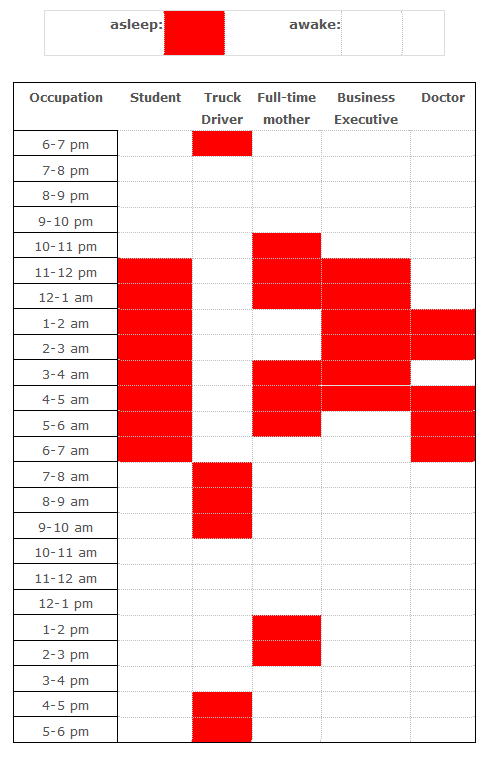 The diagram outlines the sleep pattern of students, truck drivers, mothers, business executives and doctors in a typical day. Generally speaking, students and business executives have a steady sleep pattern while others sleep in a scattered fashion. It is explicitly observed that students usually sleep 8 hours a day, from 11.00 pm to 7.00 am, without any interruption and their duration of rest is higher than people from other professions. Business executives have a continuous nap schedule but they sleep only 6 hours, from 11 pm to 5 am. Truck drivers seem like have the most sporadic sleep schedule and they sleep 6 hours a day in a scattered way in the early morning and evening time. This translation is from Laokaoya website. A similar rest agenda could be observed for full-time mothers who take rest 8 hours a day but at three different times of the day. They are usually awake at mid-night as do the truck drivers. Finally, doctors sleep only 5 hours a day, the least among the given categories, and they sleep from late night till early morning with the exception of 3-4 in the morning when they remain awake.